Cubicle design has come a long way in recent years and with a wide in variety of choice available on the market, you can now create a truly bespoke and sophisticated finish. Gone are the days of plain white cubicle doors and basic cubicle hardware, so think outside the box to create a space you are proud of! First consider the overall look you are planning to achieve. Are you looking to create a suave and sophisticated feel, or a fun and playful theme? 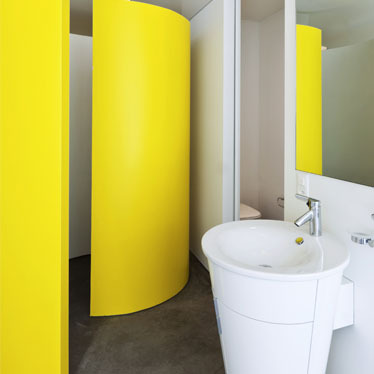 Cubicle doors and partitions can act as a fantastic statement piece within your space, as they come in a wide variety of colours and finishes including frosted glass, wood effect and bright statement colours. Tiles are also a great way to incorporate a little texture and or colour into your room, so think carefully about how you wish to coordinate your cubicle doors with any tiles and accessories you may be installing into your space too. Next consider the desired height of your partition. You can opt for a full-length board offering complete privacy to your guest, but cubicle legs are also a popular choice to add an additional touch of design to your room. Cubicle legs are also a highly practical addition to your cubicle, as they increase the stability of your units and enable easy access for cleaning and maintenance. Short legs are also available, offering the best of both worlds as they protect your partition by elevating it from floor level and maintain an increased sense of privacy for your guest too! Finally, it is important that you carefully consider your cubicle fittings. With a wide variety of cubicle indicator locks, cubicle hooks, taps and showers available on the market, there are a number of ways to add small finishing touches which make a big difference to achieving your desired finish. Also consider the practicality of the items you are purchasing. In wet area’s such as shower cubicles for example, it is advisable to install grade 316 stainless steel as it offers an increased resistance to water damage and if your facilities are better maintained they will stand the test of time.